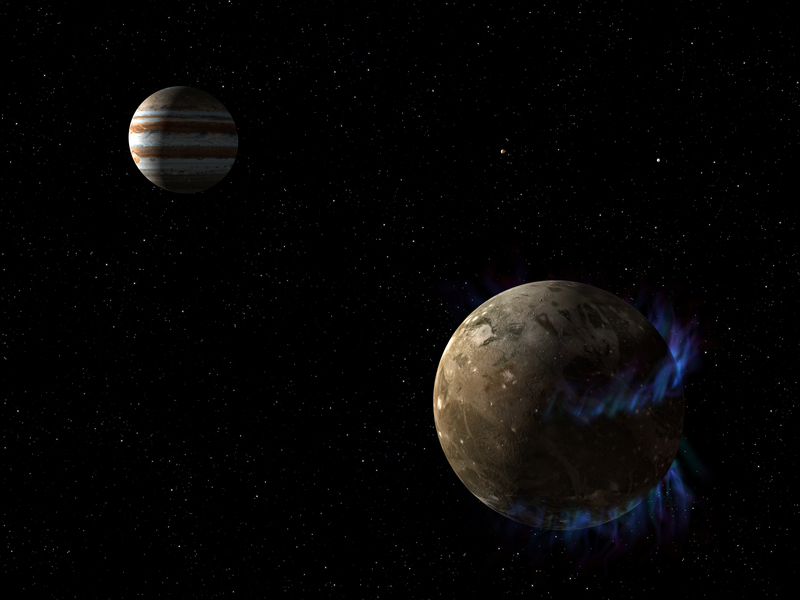 The largest moon in the solar system, Jupiter’s Ganymede, has an ocean beneath its icy shell, NASA recently announced. Ganymede becomes the newest member of to join a club of watery moons that now includes Jupiter’s other moon Europa and the moons of Saturn, Titan and Enceladus. Enceladus, a moon orbiting Saturn, not only has a subsurface ocean but it is warm enough to allow simple living systems to thrive. The subsurface ocean on Titan, yet another moon circling Saturn, might be an ocean as salty as the Earth’s own Dead Sea. Astronomers also think that Europa, another moon of Jupiter and a next-door-neighbor of Ganymede, hides a deep ocean under its constantly shifting ice surface. Ganymede is one of about 67 moons circling Jupiter and the seventh in distance from the planet, a distance that provides some shelter from the behemoth’s endless tides. It is the largest moon around the giant planet and the biggest moon in the solar system. It is smaller than Earth and slightly larger than the smallest planet, Mercury. Since we know that water is a key ingredient of life as we know it, human search for life and habitable places outside Earth has been focused on finding water. Ganymede’s ocean seem to contain a lot of it. Estimated to be much deeper than the oceans on Earth–about 60 miles thick and buried under 95 miles of ice–Ganymede’s ocean is believed to have more water than all of Earth’s. The latest evidence is based on observations from the Hubble Space Telescope, which studied Ganymede’s magnetic field for a glimpse of its interior. After decoding the colorful auroras in the moon’s polar regions that are produced by its magnetic field (the only moon in the Solar System to possess a magnetic field) scientists concluded the existence of an ocean lurking underneath. Excited much? I am. Because, clearly this brings up interesting possibilities. First, a chance of finding life of some sort on one of these moons. Second, future habitation becomes a possibility, and right here in our Solar System. Given that we have been poking and probing Mars for decades just to find traces of water, it is marvelous finding water in the far extremities of the Solar System. Something else becomes clearer also–if there is water in so many places our own backyard, what are the chances that planets and moons of all those billions of stars out there will have just the right environment to start and sustain life? Pretty big, right? ‹ The Page 99 Test–Does Your Book Cut It?